For a long time now I have been bugged by the amount of garbage I was capable of shoving into my wallet. Even though I carry it in my back pocket, it became so bulky over time that it started pulling my trousers down as well as causing me some back pain. Everyone around me knew my frustration and eventually I was presented with the Gerber money clip as a birthday gift. I have been using it for a couple of months now, so I have decided to provide you with an objective review of this compact card wallet. What Good Is a Money Clip? Like I have previously mentioned, money clips are so compact that it is impossible to overstuff them unnecessary junk. You can wear them in your front pocket (which is a safety precaution) and spare yourself of unwanted back or hip injuries because they are incredibly lightweight. All of you minimalists in the making who are looking to organize your pocket essentials and reduce your everyday carry, settling for a minimalist wallet like the Gerber money clip is definitely the right way to go! On the other hand, if you are not willing to compromise the spaciousness of a classic wallet for the sake of portability and ease of use, maybe sticking with a regular bi-fold would be the best choice for you. One of the main feature of this Everyday Carry is that it can be easily stored in your pocket and simple to deploy, this tool is seamlessly integrated into any daily task. Slim money clip has finger slot with serrated thumb rest for maximum grip, quality is assured and maintained up-to a certain level. Money clip knife has Large engrave able surface, rust proof materials, titanium coated steel body, and a G-10 front plate complete the perfect daily companion. Overall Length: 3.7″ | Weight: 2.9 oz. How much do I care about safety? Money clips and slim wallets, in general, tend to provide RFID blocking and can be worn in front pockets. Minimalist wallets are mostly contemporarily designed which includes usage of untraditional materials. In it for the practicality? Credit Card wallets are often equipped with very practical card access systems (pull-tabs, ezthumb windows, etc.) which make a world of difference. The Gerber money clip is a pure minimalist wallet. It is extremely compact (3.7 inches long) and lightweight (2.9 oz), making it ideal for front pocket carry. To me at least, it is very good looking due to being completely built from metal. 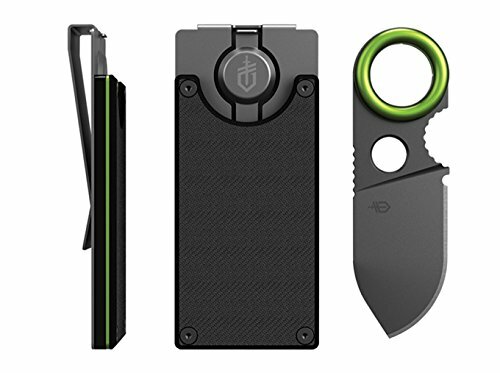 When you purchase it, you get the main credit card compartment (the body), the money clip, and a neatly looking 1.7-inch blade. I would not go so far as to categorize this item as a multi-tool wallet per se, it is more like the Trayvax wallet. Portable, easy to use, sturdy, and comes with a single tool. Of course, the Gerber money clip is a bit cheaper than the Trayvax and it does not include RFID protection. If you are an avid hiker or camper, I think that you will find this money clip to be the perfect tool for your escapades. It would not be burdensome but it would come in very handy! In case you are interested in this item just because it looks cool, I think that it would be blasphemous to buy it without actually taking advantage of its practicality. The whole money clip is built from rust-proof materials. It has a G-10 front plate, titanium coated steel body, and anodized aluminum accents. All of this means that you get as sturdy and durable of a money clip as you could possibly buy. I have never held a slim wallet which feels as unbreakable as the Gerber GDC . Also, the back side of the wallet is textured. That is a great little feature which prevents the money clip from ever slipping out of your hand. The blade can easily be slid into the money clip and it is safely held in place by the spring mechanism. On the flip side of the coin, pulling out the blade is a bit tougher, especially when the wallet is packed with credit cards and cash. Granted, given time, the mechanism will become looser, making it easier to deploy the blade. The way the spring mechanism works is extremely simple. You just press the logo button and pull out the blade. Keep in mind that after a couple of extractions, the back of the blade will get scraped. Metal on metal, it is just the nature of the beast. Given its size, the blade performs remarkably well when faced with simple tasks like cutting through cable ties. You also get a good grip of the blade because it has a serrated thumb rest. The only problem is that it is way too small. I, fortunately, do not have very large hands, but I can imagine the potential struggle of someone who has. Makers of the Gerber money clip state that the wallet can hold up to 5 credit cards as well as some cash. The truth is, if you pack the wallet with 5 credit cards, you will have a hard time deploying the blade. In order for everything to function seamlessly, do not put more than three cards and a few bills in it. The Kore slim wallet is a combination of a card holder and a money clip. The full-grain leather pouch can hold up to 10 credit cards and you can fit around 20 bills underneath the carbon fiber money clip. 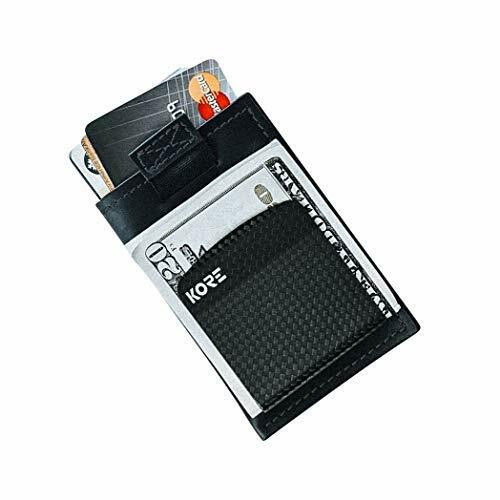 The Kore also provides your cards with RFID protection. However, it is a bit more expensive than the Gerber GDC, and it retails for $50. Nonetheless, it makes a good investment. 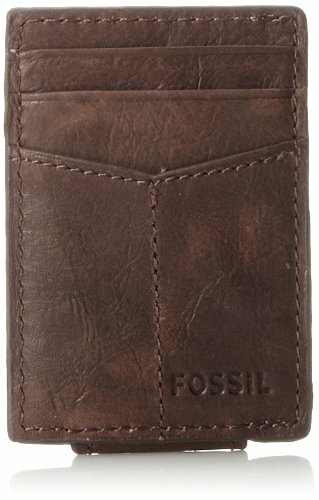 Here is a classically designed 100% leather card holder wallet made by Fossil. You can get a hold of this piece for around $20. It has a money clip on the back which can hold more than 15 bills. Credit card compartments can fit up to 8 credit cards. Traditional, elegant, and slim! If you are into that, check the Fossil out. 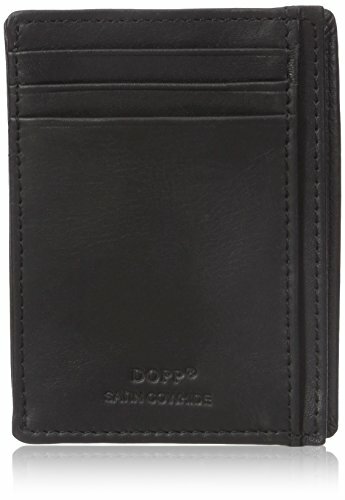 If you are looking for a fashionable leather card holder, the Regatta 88 has to get a look in. It has an 80% leather and 20% polyester body. It includes two card slots, one utility pouch, and a money clip on the back. So, it provides enough space for at least 6 credit and some business cards and receipts. You can purchase it for around $20. Apart from RFID protection, the Gerber money clip provides everything a minimalist wallet should. From reducing your everyday carry, being practical and fitting the front pocket, to protecting your physical health. There are very few reasons why you should not invest in it. Let us not forget that it is very affordable as well! Anyways, if you would take a look at some other options too, Best Men’sTravel Wallets will offer good ones. If you too are frustrated by the absence of practicality and bulkiness of traditional wallets, make sure to check out the Gerber GDC money clip .